In 2009 the first batch of VDL Automated Guided Vehicles (AGVs) has been developed with use of customer co-creation. The combination of forces enabled VDL to produce a unique vehicle with superior characteristics. Since 2012 these AGVs have been operational at Delta Terminal Rotterdam, the Netherlands. This AGV can handle (2x)20’, 40’ and 45’ ISO containers in the port of Rotterdam. Furthermore, it can lift loads up to 70 tonnes with a maximum speed of 6 metres per second. The available expertise within VDL on development and manufacturing of advanced equipment and vehicles enabled us to create this high performance and environmental friendly container carrier. The focus for this project was mainly fuel efficiency, CO2 emission, noise level reduction, reliability and maintainability. The steering of the VDL AGV is very accurate; this results in a minimized required area for the movement of a container and could potentially reduce the terminal surface area. To ensure the required performance in combination with reduced fuel and maintenance costs, VDL produced in this case an electrically driven diesel-Hybrid AGV. A small diesel engine drives a generator powering the electric motors and when peak power is required, ultra capacitors provide additional energy. To reduce the lifecycle cost the AGV has a maintenance friendly set up to maximize accessibility and reduce maintenance hours. The VDL AGV is designed in a modular way. By developing a flexible design there is no need to exchange the complete vehicle after the technical lifetime of certain components. A retrofit of the worn item will do. The second big advantage of the modular set up is the ability to adapt to specific customer demands with low impact. In 2014 an operator in Singapore ordered AGVs of which among others those of VDL Automated Vehicles. Results of tests were compared to each other and indicated that AGVs of VDL performed with the highest MTBF (Mean Time Between Failures) and the lowest MTTR (Mean Time To Repair). Alongside with these figures VDL offers a proven reliable container handling product with the lowest TCO (Total Cost of Ownership). This is achieved by delivering the best quality, MTBF and MTTR rates and ensures a sustainable container handling product. These two AGVs are based on hybrid diesel-electric technology employing ultra-capacitors with optimised power train design for lower fuel consumptions. VDL’s modular design will ease maintenance and future upgrading. The specific power-pack can be readily upgraded to adopt new technologies found within or outside the VDL Groep. The focus will be to integrate these AGVs with a third party navigation system. In 2014 a request from BASF at Ludwigshafen, Germany came to automate the logistics of their chemical plant. VDL Automated Vehicles developed and prototyped a custom AGV for this customer. 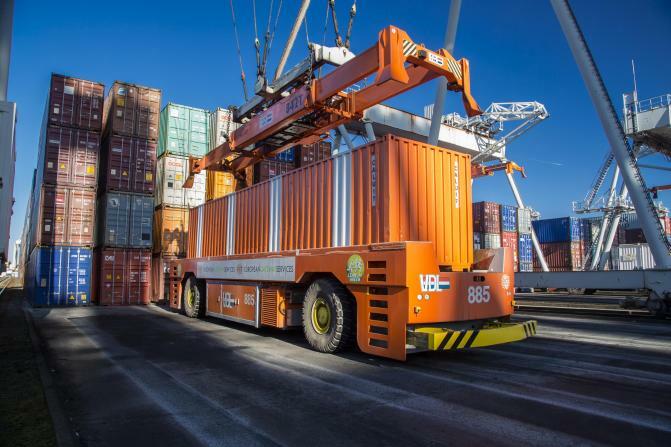 This proto AGV is an innovative, fully automatic vehicle and a further evolution of the existing VDL AGV concept, which could only transport containers in various container terminal ports. 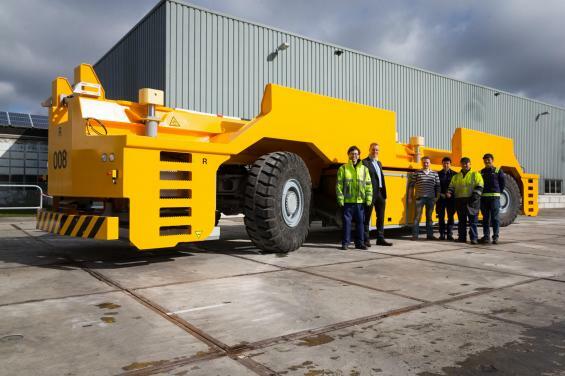 The new 16-axle vehicle with a length of 18 metres is the first vehicle in the world that no longer requires the surrounding area to be cordoned off or an ‘attendant’ to ride along. It is able to drive among other traffic independently, without such measures. This means that the VDL AGV makes driverless driving in a manned environment possible. The modular vehicle construction has been equiped with intelligent integration of computers, cameras, sensors and scanners. This is key to meet the standards of SIL2 safety level to be able to drive in manned areas. This AGV fits with VDL Groep’s ambition to be the top specialist in the field of heavy duty vehicle electrification. The vehicle is also innovative in a number of other areas: it loads and unloads the cargo up to 78 tonnes itself, and with a height of 1.15 metres has an extremely low design. As a result, the vehicle can easily drive under existing pipes in the local infrastructure. Furthermore, this concept of automated driving among manual logistics has been nominated for the Automotive Innovation Award 2017. It reached the top 3 of most innovative technologies of 2017. VDL Automated Truck was developed in close cooperation with local partner VDL ETG in Singapore. The vehicle is part of an automated horizontal transport system implemented at customer's site. The concept of VDL Automated Trucks consist of modifications on existing terminal trucks. Designing a modular concept enables VDL to implement AGV modules in Automated Trucks, simplifying technical and legislative issues for autonomous driving. Sensors, guidance software and fleet management is provided by same partner as cooperating with in AGV-project BASF Ludwigshafen. Development of the VDL Automated Truck is a strategic step for VDL towards becoming lead supplier of E-mobility in heavy industry. Furthermore, this project is forerunner of fully automated VDL E-Truck made for public road transport. Carrying over 20 years of experience in this sector, VDL is able to deliver these top quality products consisting of proven technology. Logistic company Katoen Natie Singapore - originates from Belgium - was first to order 12 VDL Automated Trucks. These vehicles will operate in a single lane route, simplifying guidance but on the other hand require a higher level of reliability. The fifth wheel of the truck will lift high-end trailers - equipped with active transport systems - and transport them between quay and depot.